265+ pictures from the first NASA race weekend of 2015. This is where we debuted Project: DANGER ZONE, our hastily built 1992 Corvette. This car ran well in TTC and won the class both days and reset the track record for TTC from a 1:50.5 to a 1:43.7. The new Hoosier R7 tires wore GREAT and we think we will see 3+ race weekends out of a set. Lots to do to the car and we hope to improve on the performance a bit this season. 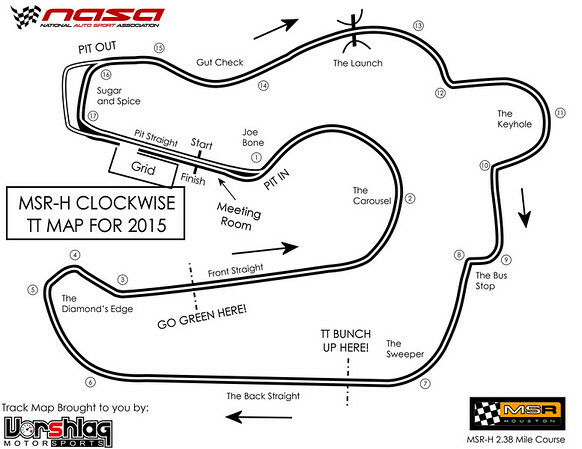 This is the map we made for the Time Trial group, showing where to bunch up and go green on each "out lap". It helps to keep the field together for the first few hot laps, to prevent traffic and allow the field to get good, fast laps in.